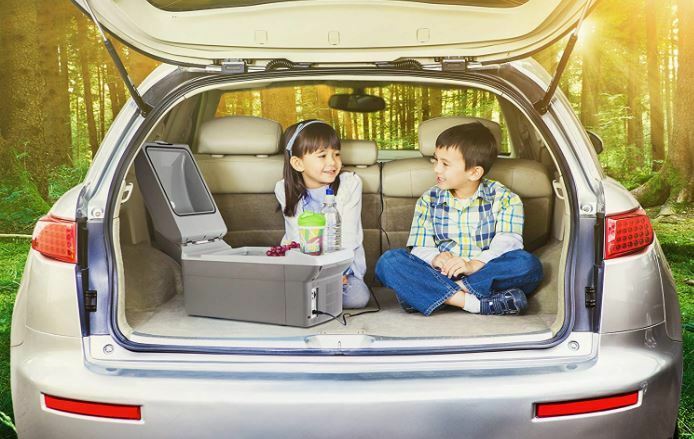 The Wagan EL6214 is a compact personal cooler that is perfect for road trips, camping and use in RVs and boats. You can also use it at home to keep medicine, breast milk or cosmetics cool. It is a thermoelectric cooler so don’t expect it to be as good as a mini fridge. It works best when you use it to keep cold/frozen items cold. The compact and lightweight design makes it easy to carry around. It includes a carrying strap and two cupholders integrated into the lid. Overall, it is an excellent choice for anyone looking for a compact thermoelectric cooler with a decent amount of space to carry food and drinks. Reduced performance in very high temperatures. Do not leave it in the sun or in a parked car for long periods. Power: Plugs into your car’s charger or any 12V outlet. AC adapter available separately. 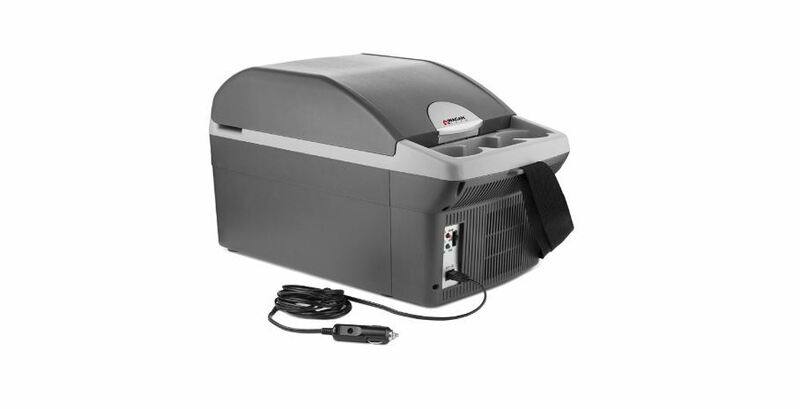 The Wagan EL6214 cooler uses thermoelectric technology to cool and warm the inside. It’s not as efficient as compressor technology used in mini fridges but it’s cheaper, uses way less energy and requires zero maintenance. While it will not freeze your drinks, it maintains them at a cool temperature. It can also warm your food or keep your takeout warm. Just flip a switch at the back, and the system switches to warming mode (max 140 degrees). Two indicator lights show which mode is currently active. As I mentioned, this cooler will not freeze your food or drinks. It also takes forever to cool down anything you put in. Like an ice chest, it performs best at maintaining cold or frozen stuff. If you put in some frozen food, it will keep it that way for days. Any cold drinks inside the cooler stay cold even in hot weather. To get the most out of the cooler, pre-chill or pre-freeze food and drinks before you put them inside. It will maintain them at a constant temperature of 36 degrees below ambient temperature. The Wagan EL6214 doesn’t provide a lot of space. You can fit a couple of 2l water bottles, some soda cans and a few fruits. It’s ideal for at most 2-3 people. The upside is that it’s smaller than most portable coolers. Even if you have a small car, it can fit on the floor between the seats. You can also place it on one of the seats or in the trunk. A nylon carrying strap makes it easy to carry the cooler to and from the car. Like most portable electric coolers, the Wagan 6214 plugs into your car’s 12V socket. The 9ft power cord is conveniently long, letting you place the cooler wherever you want without worrying whether you can reach the socket. A built-in side compartment keeps the cord out of the way when it’s not plugged in. Two cup holders integrated into the lid come in handy when you are camping or out on a picnic. They are a bit small, so not all bottles can fit in them. 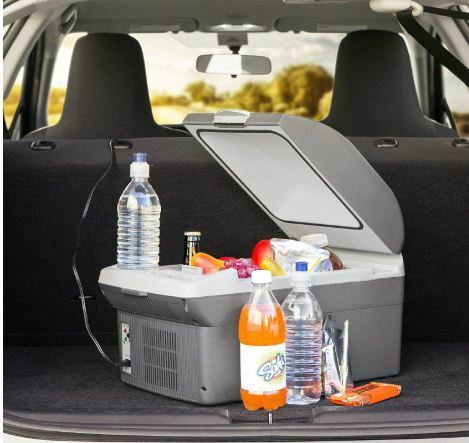 You are looking for a compact and lightweight cooler for road trips, picnics, and camping. You want a cooler that can also warm. You are looking for a low-maintenance and low-energy electric cooler. 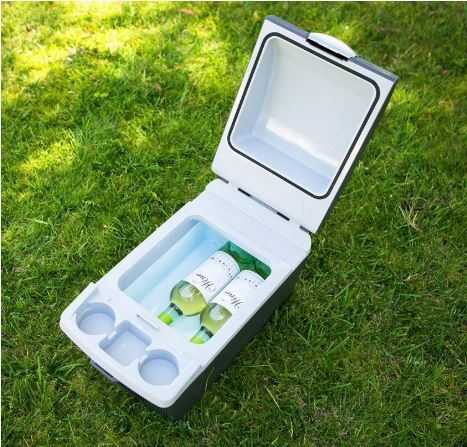 You want a cooler that can quickly chill or freeze food and drinks.